Two hungry IT geeks in a wild quest to go where our taste buds have never been before. Balewadi High Street has been transformed to an ultimate gastronomical playground for all serious foodies. From food chains to glitzy restaurants to bars, they have it all. And the newest addition to the already impressive line up? Masala Bar. A Zorawar Kalra initiative that is already pretty popular in Mumbai. And Masala in the name means there's some brilliant Indian Fusion cuisine to be had. The launch party was obviously a big hit and lasted till the wee hours. Mr. Kalra was in attendance and he doubled as the ever-gracious host. On being asked why he chose Pune for Masala Bar during a quick tete-a-tete he elaborated about how Pune has evolved over the years as a strong contender for business investment and how it has cultured a sophisticated taste with people being more receptive of new and experimental cuisine. 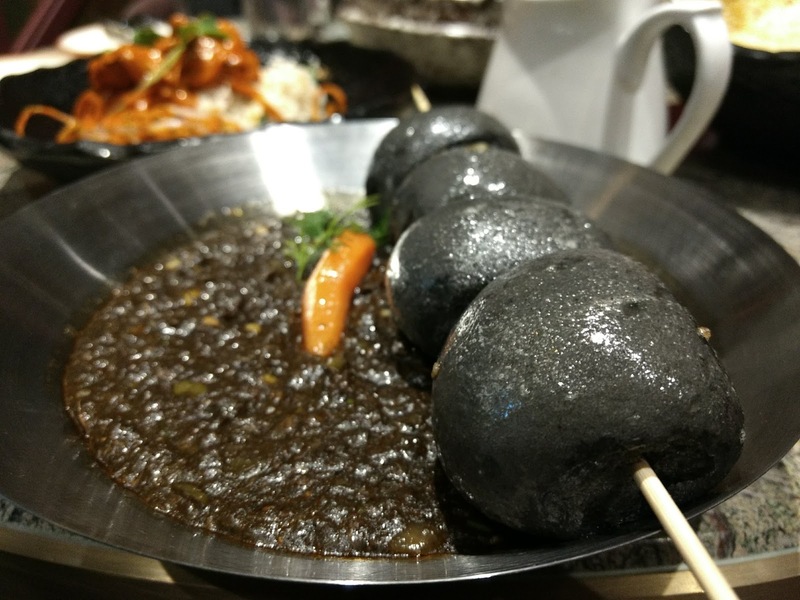 Which is just what Masala Bar brings to the table. 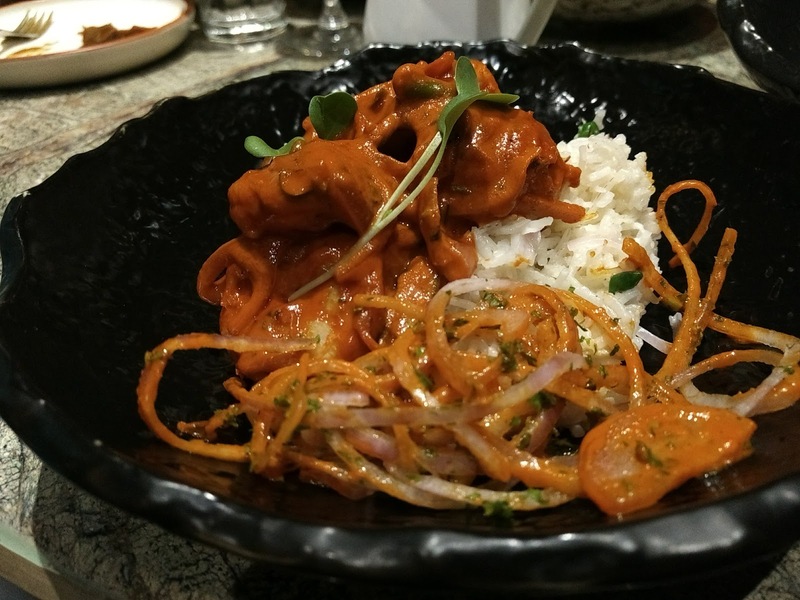 A new age Indian fusion cuisine that wants to push boundaries with the regular Indian food. Of course, we have been privy to that with the Farzi Cafe too but I was dying to see what new things Masala Bar adds to fusion scene. 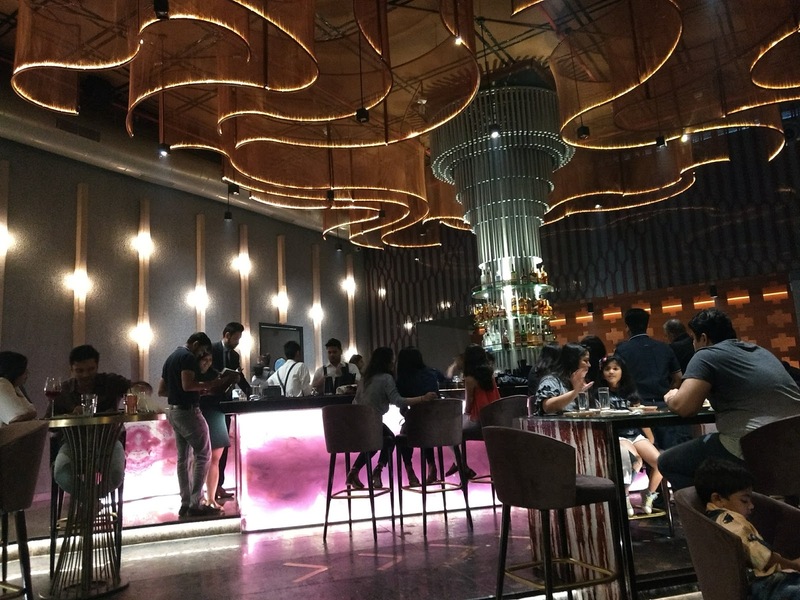 When we went back to the restaurant for a proper tasting session, it was same upscale, glitzy place from the launch party albeit much more sombre now, which promised of a nice, quiet dining experience. The place has, of course, been done up beautifully with warm tones, plush seating and stunning light installations. There is a huge bar island in the middle of the dining area which is constantly churning up eye catching concoctions. One of the first drinks that we had and our favorite from the night was the CHAI PE CHARCHA with the signature smokes and theatrics. As a rule, I'm not the most vocal supporter of all the frills and smoke. I like my food simple and delicious and same goes with my drinks. Well, for a not so very fusion friendly in the current setting I actually ended up loving the drink! 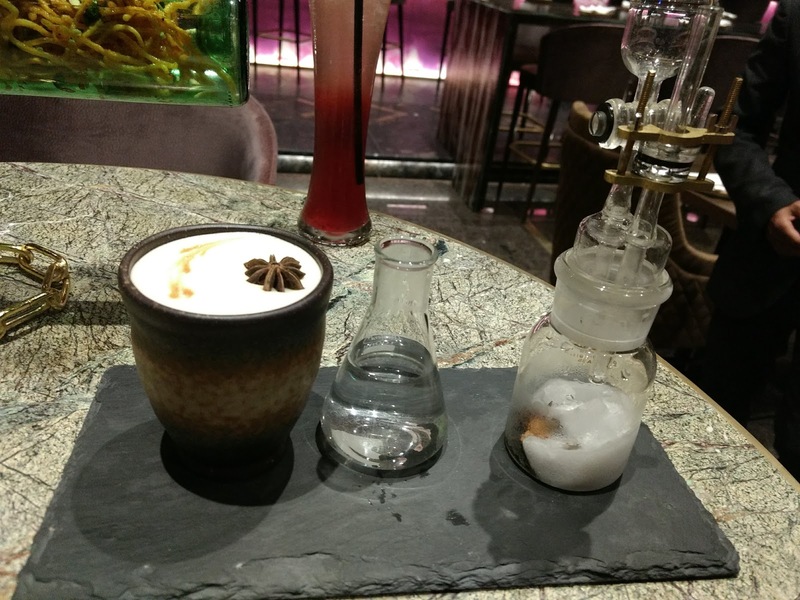 The whiskey based cocktail that came out of all the fragrant fumes was a pretty solid mix of chai-tea and citrusy flavors which worked so well with the alcohol. 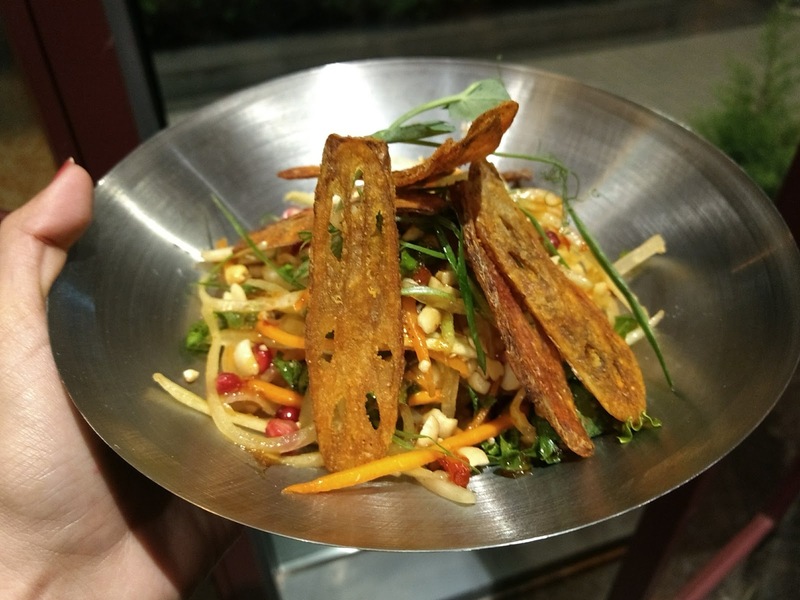 CHINI CHINESE BHEL was a asian flavored, crispy noodles dish swathed up in tangy yet delicious flavors. It was a good dish start with. Perfect for light bites with drinks. BANGKOK SALAD was a another hit for me. It was fresh bowl of julienned vegetables and tossed in a light summery dressing. It had raw papaya, mango, pomegranate and herbs. 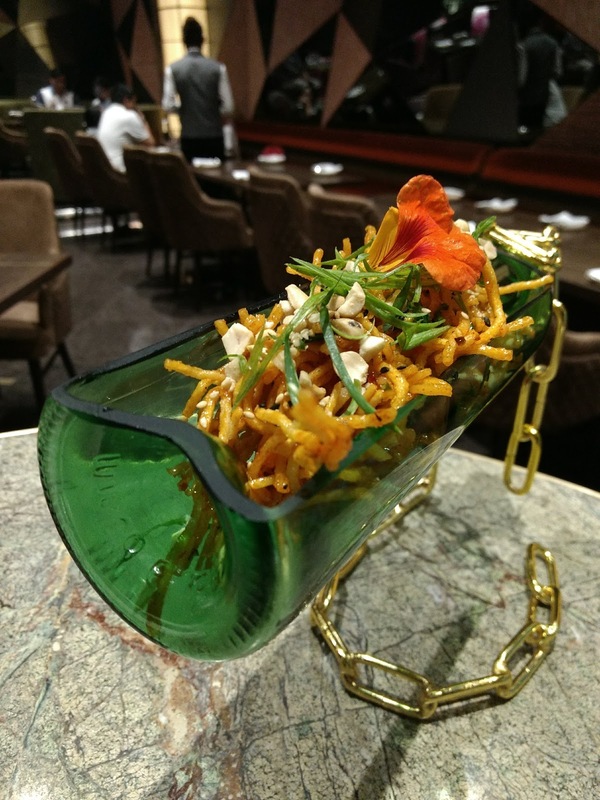 Topped with crunchy lotus stem crisps, all the elements resonated beautifully with every bite! CHING CHONG PORK RIBS had beautiful flavors. The sweet, sticky sauce was married beautifully to the tender meat. It made for a delicious, delicious meal. If only the portion size wasn't as small. The dish comes with a small sized pork rib, so if you had been planning to share, you might want to order another one! 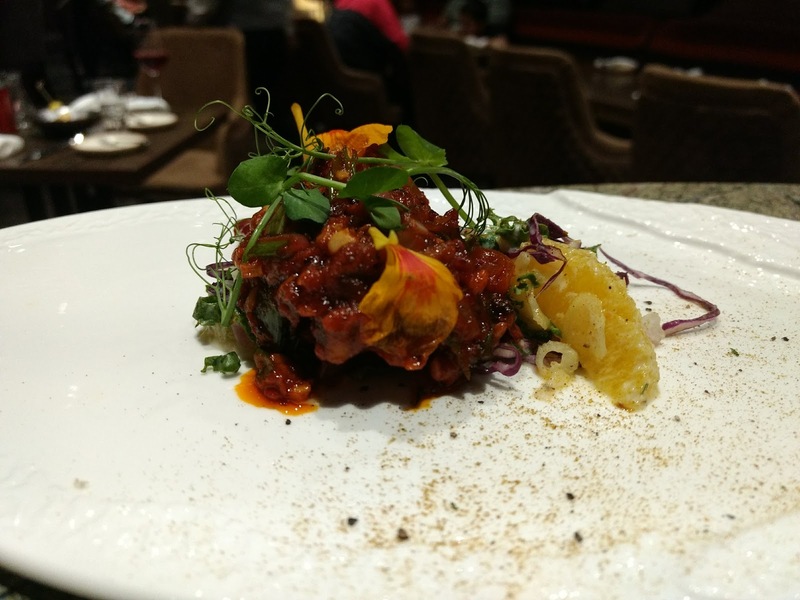 CARBON PAO BHAJI. I had mixed feelings about this one because from what I have learnt from the carbon trend of 2017 is that not all things black is good. The bhaji was beautifully spiced and the pao, though black, were soft and yielding. I loved the combo. PUFFED GRAINS AND PESTO KHICHDI WITH PARMESAN OLIVE CREAM. This was soul food. That's it. After a night of drinking out, when you are famished and want to eat to settle your stomach, a bowl of this khichdi is what you want. 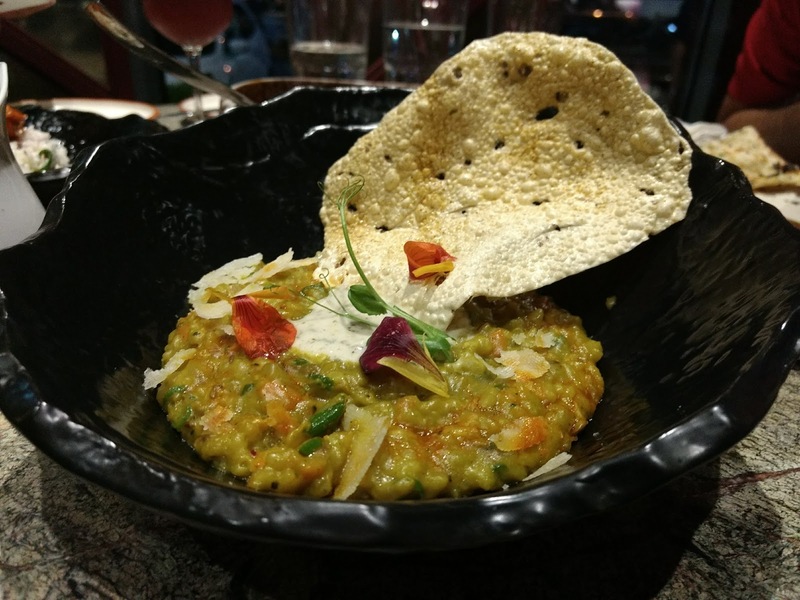 The creamy risotto like consistency and the comfortable khichdi flavors did magic! CALINGUT PRAWN CURRY with rice was like a good bowl of Thai curry, which is my favorite curry. The coconut milk based curry was so creamy and delicious and the prawns were cooked delicately. Definitely a hit! 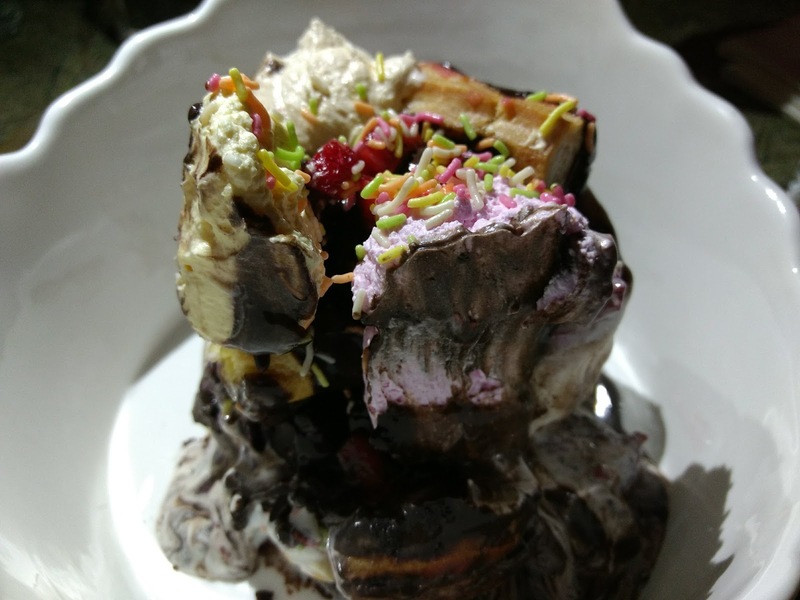 CALORIE TOWER was a smorgasbord of various elements put together and waiting to be discovered. Doused in whipped cream and chocolate sauce the dessert had brownie chunks, profiteroles, ice cream and cookies in the mix. What a heady way to end the meal!! Well, these were just the ones that I loved from the menu. But there are a lot more to try. The theatrics and fusion are fun to a point but at the end of the day you want to take a spoonful of your plate and love it. That being said, Fusion is the new fad. And it is here to stay. So go ahead and take this gastronomic adventure to find something new that you might end up loving! It was a beautiful dinner and we have Nikita to thank for inviting us over. Also, Team Masala Bar needs a special mention for taking care of us so well. The Kukkad Diaries is borne out of sheer love for chicken, good food, great cafes and fondness for writing, in that order. 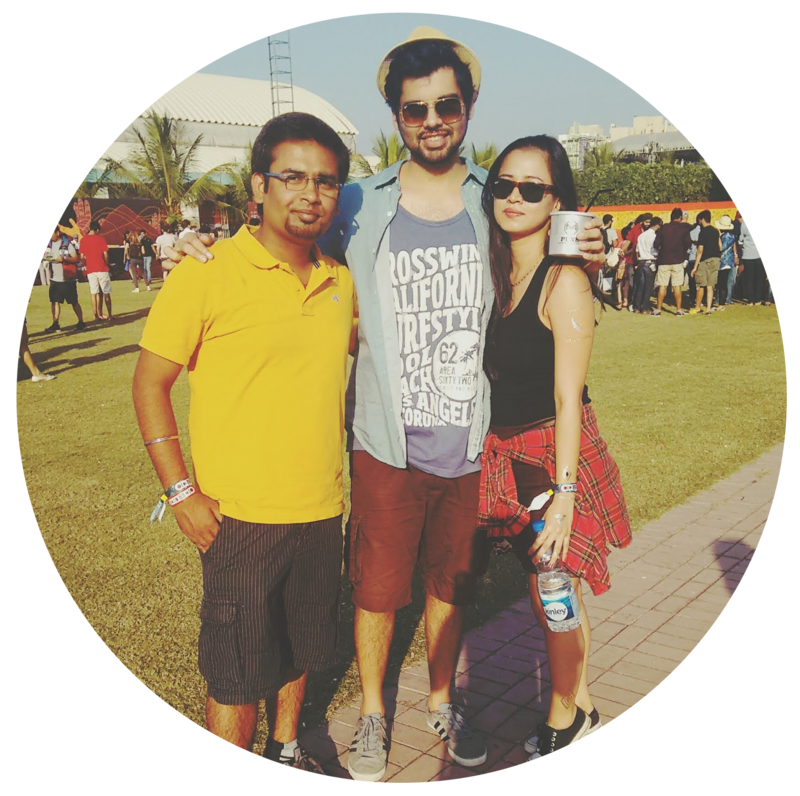 Started off, not so long ago by two quite overstuffed yet very zealous IT professionals, TKD hope to share their gluttony and discoveries with foodies of the world.